4 His family consisting of eleven souls, namely, my father, Joseph Smith; my amother, Lucy Smith (whose name, previous to her marriage, was Mack, daughter of Solomon Mack); my brothers,bAlvin (who died November 19th, 1823, in the 26th year of his age), cHyrum, myself, dSamuel Harrison, William, Don Carlos; and my sisters, Sophronia, Catherine, and Lucy. 8 During this time of great excitement my mind was called up to serious reflection and great uneasiness; but though my feelings were deep and often poignant, still I kept myself aloof from all these parties, though I attended their several meetings as often as occasion would permit. In process of time my mind became somewhat partial to the Methodist sect, and I felt some desire to be united with them; but so great were the confusion and astrifeamong the different denominations, that it was impossible for a person young as I was, and so unacquainted with men and things, to come to any certain conclusion who was bright and who was wrong. 10 In the midst of this war of words and tumult of opinions, I often said to myself: What is to be done? Who of all these parties are right; or, are they all wrong together? If any one of them bearight, which is it, and how shall I know it? 12 Never did any passage of ascripture come with more power to the heart of man than this did at this time to mine. It seemed to enter with great force into every feeling of my heart. I reflected on it again and again, knowing that if any person needed bwisdomfrom God, I did; for how to act I did not know, and unless I could get more wisdom than I then had, I would never know; for the teachers of religion of the different sects cunderstood the same passages of scripture so differently as to destroy all confidence in settling the question by an appeal to the Bible. 13 At length I came to the conclusion that I must either remain inadarkness and confusion, or else I must do as James directs, that is, ask of God. I at length came to the determination to “ask of God,” concluding that if he gave wisdom to them that lacked wisdom, and would bgive liberally, and not upbraid, I might venture. 17 It no sooner appeared than I found myself adelivered from the enemy which held me bound. When the light rested upon me Ibsaw two cPersonages, whose brightness and dglory defy all description, estanding above me in the air. One of them spake unto me, calling me by name and said, pointing to the other—This is MyfBeloved gSon. Hear Him! 23 It caused me serious reflection then, and often has since, how very strange it was that an obscure aboy, of a little over fourteen years of age, and one, too, who was doomed to the necessity of obtaining a scanty maintenance by his daily blabor, should be thought a character of sufficient importance to attract the attention of the great ones of the most popular sects of the day, and in a manner to create in them a spirit of the most bittercpersecution and dreviling. But strange or not, so it was, and it was often the cause of great sorrow to myself. 30 While I was thus in the act of calling upon God, I discovered aalight appearing in my room, which continued to increase until the room was lighter than at noonday, when immediately a bpersonageappeared at my bedside, standing in the air, for his feet did not touch the floor. 32 Not only was his robe exceedingly white, but his whole person was aglorious beyond description, and his countenance truly likeblightning. The room was exceedingly light, but not so very bright as immediately around his person. When I first looked upon him, I was cafraid; but the dfear soon left me. 33 He called me by aname, and said unto me that he was abmessenger sent from the presence of God to me, and that his name was Moroni; that God had a work for me to do; and that my name should be had for cgood and evil among all nations, kindreds, and tongues, or that it should be both good and evil spoken of among all people. 35 Also, that there were two stones in silver bows—and these stones, fastened to a abreastplate, constituted what is called thebUrim and Thummim—deposited with the plates; and the possession and use of these stones were what constituted c“seers” in ancient or former times; and that God had prepared them for the purpose of translating the book. 40 In addition to these, he quoted the eleventh chapter of aIsaiah, saying that it was about to be fulfilled. He quoted also the third chapter of Acts, twenty-second and twenty-third verses, precisely as they stand in our New Testament. He said that that bprophetwas Christ; but the day had not yet come when “they who would not hear his voice should be ccut off from among the people,” but soon would come. 41 He also quoted the second chapter of aJoel, from the twenty-eighth verse to the last. He also said that this was not yet fulfilled, but was soon to be. And he further stated that the fulness of thebGentiles was soon to come in. He quoted many other passages of scripture, and offered many explanations which ccannot be mentioned here. 42 Again, he told me, that when I got those plates of which he had spoken—for the time that they should be obtained was not yet fulfilled—I should not show them to any person; neither the breastplate with the Urim and Thummim; only to those to whom I should be commanded to show them; if I did I should beadestroyed. While he was conversing with me about the plates, the vision was opened to my bmind that I could see the place where the plates were deposited, and that so clearly and distinctly that I knew the place again when I visited it. 46 By this time, so deep were the impressions made on my mind, that sleep had fled from my eyes, and I lay overwhelmed inaastonishment at what I had both seen and heard. But what was my surprise when again I beheld the same messenger at my bedside, and heard him rehearse or repeat over again to me the same things as before; and added a caution to me, telling me that Satan would try to btempt me (in consequence of the indigent circumstances of my father’s family), to get the plates for the purpose of getting crich. This he forbade me, saying that I must have no other object in view in getting the plates but to glorify God, and must not be influenced by any other dmotive than that of building his kingdom; otherwise I could not get them. 55 As my father’s worldly circumstances were very limited, we were under the necessity of alaboring with our hands, hiring out by day’s work and otherwise, as we could get opportunity. Sometimes we were at home, and sometimes abroad, and by continuous blaborwere enabled to get a comfortable maintenance. 56 In the year 1823 my father’s family met with a great aafflictionby the death of my eldest brother, bAlvin. In the month of October, 1825, I hired with an old gentleman by the name of Josiah Stoal, who lived in Chenango county, State of New York. He had heard something of a silver mine having been opened by the Spaniards in Harmony, Susquehanna county, State of Pennsylvania; and had, previous to my hiring to him, been digging, in order, if possible, to discover the mine. After I went to live with him, he took me, with the rest of his hands, to dig for the silver mine, at which I continued to work for nearly a month, without success in our undertaking, and finally I prevailed with the old gentleman to cease digging after it. Hence arose the very prevalent story of my having been a money-digger. 58 Owing to my continuing to assert that I had seen a vision,apersecution still followed me, and my wife’s father’s family were very much opposed to our being married. I was, therefore, under the necessity of taking her elsewhere; so we went and were married at the house of Squire Tarbill, in South Bainbridge, Chenango county, New York. Immediately after my marriage, I left Mr. Stoal’s, and went to my father’s, and bfarmed with him that season. 61 The excitement, however, still continued, and rumor with her thousand tongues was all the time employed in circulatingafalsehoods about my father’s family, and about myself. If I were to relate a thousandth part of them, it would fill up volumes. The persecution, however, became so intolerable that I was under the necessity of leaving Manchester, and going with my wife to Susquehanna county, in the State of Pennsylvania. While preparing to start—being very poor, and the persecution so heavy upon us that there was no probability that we would ever be otherwise—in the midst of our afflictions we found a friend in a gentleman by the name of bMartin Harris, who came to us and gave me fifty dollars to assist us on our journey. Mr. Harris was a resident of Palmyra township, Wayne county, in the State of New York, and a farmer of respectability. 65 “He then said to me, ‘Let me see that certificate.’ I accordingly took it out of my pocket and gave it to him, when he took it and tore it to pieces, saying that there was no such thing now as ministering of aangels, and that if I would bring the plates to him he would translate them. I informed him that part of the plates were bsealed, and that I was forbidden to bring them. He replied, ‘I cannot read a sealed book.’ I left him and went to Dr. Mitchell, who sanctioned what Professor Anthon had said respecting both the characters and the translation. 69 Upon you my fellow servants, in the name of Messiah, I confer the aPriesthood of bAaron, which holds the keys of the ministering of angels, and of the gospel of repentance, and ofcbaptism by immersion for the remission of sins; and this shall never be taken again from the earth until the sons of dLevi do offer again an offering unto the Lord in erighteousness. 73 Immediately on our coming up out of the water after we had been baptized, we experienced great and glorious blessings from our Heavenly Father. 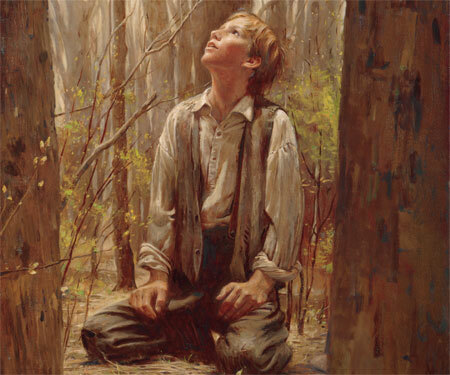 No sooner had I baptized Oliver Cowdery, than the Holy Ghost fell upon him, and he stood up andaprophesied many things which should shortly come to pass. And again, so soon as I had been baptized by him, I also had the spirit of prophecy, when, standing up, I prophesied concerning the rise of this Church, and many other things connected with the Church, and this generation of the children of men. We were filled with the Holy Ghost, and rejoiced in the God of our salvation. 74 Our minds being now enlightened, we began to have theascriptures laid open to our understandings, and the btrue meaning and intention of their more cmysterious passages revealed unto us in a manner which we never could attain to previously, nor ever before had thought of. In the meantime we were forced to keep secret the circumstances of having received the Priesthood and our having been baptized, owing to a spirit of persecution which had already manifested itself in the neighborhood. 75 We had been threatened with being mobbed, from time to time, and this, too, by professors of religion. And their intentions of mobbing us were only counteracted by the influence of my wife’s father’s family (under Divine providence), who had become veryafriendly to me, and who were opposed to mobs, and were willing that I should be allowed to continue the work of translation without interruption; and therefore offered and promised us protection from all unlawful proceedings, as far as in them lay. Thanks for reading all the way to the end! I hope you felt the truth in this story, and that it finds a place in your heart. Your post brings me peace... Thank you for taking the time to publish it.